Hey there gal pals! I've missed ya'll! I know I have been an MIA blogger lately, but my family has been in town!! SO FUN! So this week I vow to give you a little more [Life of Meg] oomph! I have such a wonderful, touching story to share with you later this afternoon, and it may even bring tears to your eyes, so stay tuned! So wonderful! Alright, so let's get down to business, shall we? May I ask a favor? Please spread the word about Mingle Monday today! I will love you forever! I'll be back this afternoon in full posting flair, so get excited! I've missed you guys so much!!! I love anything that burns! haha. Love my Jillian Michaels DVDs, Pilates, Yoga, dancing....bring it on! I get stuck on the elliptical every time! My favorite workout activity is definitely yoga. I am fortunate enough to have staff yoga each week at my job, which makes is SUPER convenient. I visited cornflake dreams, who just seems to be full of happiness. Her re-cap of her weekend was pretty much an ideal time to me. She also has a great layout/design on her blog. My favorite workout routine is kickboxing and boxing. It helps me get my anger out and burns tons of cals. Love Jillians 30 day shred! I'll be back to leave some love when there is more on the list! My favorite workout activity? Does mattress mambo count?? Hahaha...if not I like to do the elliptical! I visited Waiting to be His Wife. She's just getting back into blogging, but she has some great style! Check out her awesome matte and shiny black nails! I'm in love! I also visited Laugh Until Your Cheeks Hurt. I loved her most recent post about the beautiful Reese Witherspoon. Swoon-she's my girl crush! I definitely think you should check both of these ladies out! I stopped by Dance and Dream- I loved her post about bathroom decor! It was gorgeous. I also visited Sweet Silver Lining and she and I share a love for country music & concerts. Jillian - I've always wanted to try a kettle bell workout! So glad to hear they are awesome for toning! I am loving these idea ladies! Things I want to try: Jillian Michaels DVDs, yoga classes, boxing! SO FUN! PS- I love Zumba class! It's by far my fave! Running is a great stress reliever outside in the spring/fall! Too hot now! I love Jillian Michael's 30 Day Shred for at home, but I also love Zumba-ing. So fun! I visited Waiting to be His Wife and Adventures in Amber-land. The first had a really cute post about random things, including an amazing-looking ideal dinner. Amber talked about facebook etiquette and asked her readers how much they would post on facebook. Quite interesting!! As for my favorite work out... I really like taking classes like kickboxing, zumba, and step. The classes push me way farther than I would ever push myself! I'm new to Mingle Monday! Excited to join! :-) Laugh Until Your Cheeks Hurt actually mentioned workout clothes in her post! Loved her blog - very cute design and she seems super upbeat! Love happiness in my fellow bloggers! Stop by and check out my Giveaways! 2 ending in the next week, plus I have 2 more to post by Friday! Great stuff!!!! I like yoga and classes like Zumba too! Swimming would be my next favorite! I'm a new follower of Laugh Until Your cheeks hurt. Her blog is super cute! Happy Monday! Visited Love, Julie - I'm so jealous of the trip she's currently taking! Hello - What a cool idea!! Love, Julie - great blog!! Favorite way to burn those glasses of wine off include Tracy Anderson DVD's - running - yoga & pilates!!! Happy Monday Meg & followers! My favorite workout is playing basketball but because of this little...I mean big bun in the oven and the scorturing heat here in south Texas I'd have to say swimming and spin class! 2. Learning Patience: lately I've been tired of cooking the same ol stuff for me and the hubby so I'm thrilled to have stumbled upon her blog. Great recipes for meals and goodies...Check. It. Out. I stopped by Laugh Until Your Cheeks Hurt--she had a great post about Reese Witherspoon and how awesome she is (style-wise and otherwise)! Check it out! I also went to Nestful of Love--she had a yummy recipe for an alternative to using chicken all the time (kielbasa!) Go look, it looks yummy! My go-to workout is anything Jillian Michaels tells me to do. I feel super fit when I do her workouts (and usually pretty sore afterwards too)! Happy Monday! An Inner Voice - she's so cute and preggers! Jillian @ Cornflake Dreams - I love her style and taste! Learning Patience- She has some seriously amazing looking recipes! Also- I really want to try Tracy Anderson DVD's! I want Gwennie's bod too, Tracy!! What a fun Monday! I love going running with my husband. He is in way better shape than me so he will zag sag across the streets while I just go normally so we can both get a work out. lol. I stopped by Adventures in Amber-land. She's struggling with an awkward situation with a close friend. I couldn't really offer any good advice but at least I could commiserate. Next I stopped by A Little Bit of Everything. Last time I stopped by she had just had her bridal shower; this time she's just gotten married! My favorite workout is like many of the ladies above - love doing 30 Day Shred at home and Zumba classes at the gym! Right now I'm heading out to do 15 minutes cardio and 30 minutes weight training - my typical night at the gym. I hate forcing myself to do the stair climber! 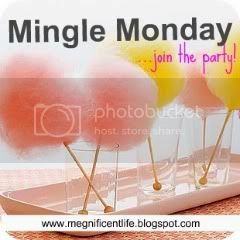 I'm new to Mingle Monday and love it! I looked at Cornflake Dreams - love the blog design and weekend recap! If I could afford to all the time I would horse ride but instead I gym as my 'favourite' activity! Yay! Welcome back :D I've missed you! My favorite workout activity is DANCE. I visited Waiting Wife- I loved her Monday Minute link up post. Very cute. Also, Love, Julie- who had a guest post up from Cornflake Dreams, whose blog I also love. Always great blogs linked up here! I go to the gym, go for a run, and have just recently started going to yoga. So much fun! Lots of great blogs this week! I'm loving the book "Room" that Librianista read. It's up next on my bookshelf. Cornflake Dreams and her lemon cravings introduced me to Lemon Poppyseed Pancakes A.K.A. heaven on earth. And Joanna at Dance and Dream forever is going to be having a giveaway next month. Hope to see you ladies over at my little piece of the blogosphere!